Presses: Windmill and occasionally a Vandercook. Learning: Before coming to Boxcar I had 7 years of fine art printmaking. Nicole Hand taught me the wonders of printmaking. A lot of my letterpress knowledge comes from nerding out with Carrie. 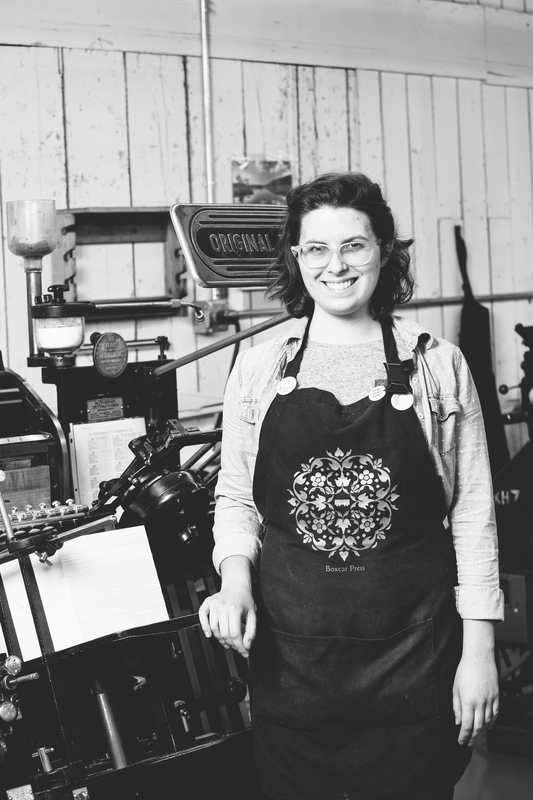 Print shop essentials: letterpress notes, apron, and a cup of tea. Favorite part of letterpress printing: seems like every day I learn something new about letterpress. Not just about printing, but the machines themselves, and how they were designed. Music of choice when on press: electronic, alternative, R&B/soul. I am constantly searching for some new tunes. Best letterpress printing trick: doing a paper feed test before putting ink on paper. It allows me to catch any doubles or adjust the sucker bor tilt as needed. Printing space: constant flux between tidy and messy, depending on what moment I am at on press. Proudest moment in printing career: getting the job here at Boxcar. Having put a great deal of time and effort into studying printmaking, I am proud to have a job that is my passion. A fun fact about Boxcar Press: I first learned about Boxcar when I moved to Syracuse for grad school. I attended a tour of the facilities, met some long-time print friends – 3 years later – I am employed here and couldn’t be more delighted. Extracurricular activities: Studio art practice, drawing, sewing, mixed media works on paper. Hiking, camping, and spending time outdoors. Accruing house plants, and propagating and sharing them with friends. This entry was posted by alison.cotsonas. Bookmark the permalink.